Aerospace Insulation Market size was valued at over USD 3 billion in 2017 and is estimated to exhibit around 7.5% CAGR from 2018 to 2024. Rising production of commercial and military aircraft across the globe will fuel aerospace insulation market during forecast period. Proliferating military sector owing to rising defence budget has resulted in increasing demand for military aircrafts, further escalating the revenue generation. For instance, in February 2018, the U.S. has increased the military spending by around USD 80 billion as compared to 2017. Growing demand for lightweight materials offering thermal, acoustic and electrical insulation offering compliance with stringent norms of Federal Aviation Administration (FAA) will boost the product demand. Increasing urbanization has resulted in shifting preference towards air travel and improved aircraft deliveries, further fuelling product penetration. In addition, the industry is constantly witnessing innovations in insulating materials owing to increasing need of high thrust turbofan engines. 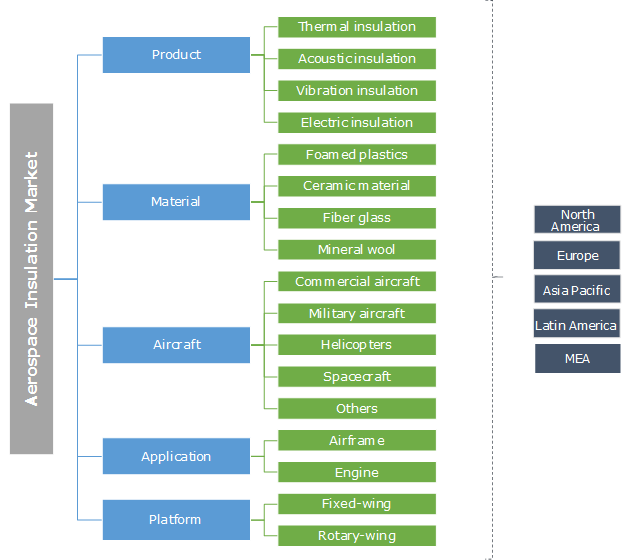 Shifting business activities from traditional western regional towards the emerging countries will further offer stable growth prospects to the aerospace insulation market players. Product manufacturing requires deployment of high quality materials sufficing the aerospace standards. Industry participants face challenge associated with the quality accreditations that may hamper the market growth. In addition, recyclability issues of the composite insulating may challenge the industry growth. However, industry players are investing heavily in R&D to enhance the overall product quality and reduce the aircraft weight. Intensifying demand for lightweight materials offering enhanced performance is among major trends witnessed across the industry. The aircraft manufacturers are focusing on adoption of cost effective initiatives including waste reduction activities with implementation of lean manufacturing process. Introduction in product line complying with the Federal Aviation Regulations (FAR) 25.856 and 25.853 is among key strategy resulting in strong industry foothold. For instance, in October 2013, DuPont introduced Nomex XF offering service for aircraft fuselage. Thermal insulation accounts for over 70% revenue share owing to its implementation for thermal and fire protection. The product has major application for critical data recorders and heat shields deployed in thrust reversers and ducts. Industry players are developing products that are offering engineered solution sufficing the stringent requirement for weight specifications, temperature and superior performance. Electrical aerospace insulation market size will witness around 8.5% CAGR with installation in electric drive system of aircrafts. Replacement of non-electrical systems will induce positive impact on overall industry share. Advantages including avoidance of overheating and efficient management of temperature will propel the product demand. Ceramic material dominates the market with over 50% share and will exhibit rapid growth over the forecast timeframe. Modern and advanced ceramic materials have been established in multiple, and viable application across aviation and aerospace design, development and manufacturing. The material is widely used for aerospace applications including magnets, batteries, and semiconductors for aircraft tiles. Foamed plastics aerospace insulation market will witness healthy growth over the forecast timeframe. Factors such as low rate of vapor permeability, superior insulation, less product wear and low water absorption will drive the material demand. Innovations in aeronautical industry regarding compatibility and ease in manufacturing will offer easy laminate, saw, rout, weld and die cut operations, which in turn will provide positive outlook to industry growth. Commercial aircraft leads aerospace insulation industry owing to rising production of aircrafts across the globe. Rising disposable income has resulted in shifting preference towards air travel. This has led to a surge in passenger traffic, especially in emerging countries, further contributing to revenue generation. Helicopters segment will witness steady growth with increasing fleet size. The helicopters are used in multiple applications including corporate services, disaster management, defence and law enforcement. Further, existing fleets are undergoing upgradation for military combats. Higher demand for products offering enhanced safety and smooth operation will fuel the industry growth. Airframe aerospace insulation market will register over USD 1.4 billion revenue by 2024. Manufacturers are enhancing their product portfolio including thermal and acoustic insulation for all type of aircrafts. Enhanced product quality along with competitive priced product will aid industry share. Further, customized product offering superior fabrication tooling as per the client requirement will fuel product penetration. Engine segment will witness significant gains over the forecast timeframe owing to cooling requirement to ensure smooth functioning of the engines. In addition, leaks in engine baffles may results in overheating and reducing overall aircraft performance. The noise is generated by engine and aerodynamics. Insulation is required to attenuate the noise and offer comfort to the passengers. In 2017, fixed-wing aircraft leads the aerospace insulation market share and is expected to continue its dominance over the forecast time frame. This can be attributed to rising aircraft demand from commercial and military sector. Major countries are investing significantly in replacement of old aircraft fleet thereby improving overall industry share. The Federal Aviation Administration Fire Research and Safety Program are investing in R&D to improve the overall aircraft performance. Rotary-wing will witness strong growth over the forecast timeframe owing to increasing demand for helicopters across military segment. Increasing investment towards avionics industry fuelling the overall production capacity will fuel the insulation market from rotary wings. Further, strong productivity, skilled resources, improvement in aircraft design and equipment will positively influence industry size. North America account for over 40% of overall market size in 2017. Higher consumer spending along with rising age of commercial aircraft are among the key factors influencing the overall product penetration. Increasing development in weight reduction coupled with demand for fuel efficient materials will support the business growth. Moreover, huge defence spending in the U.S. resulting in constant growth will induce positive impact on the regional share. APAC led by China, India and Japan is expected to witness steady growth during the forecast time frame. Increasing demand from commercial aircraft along with increasing flight iterations are expected to boost the product demand. 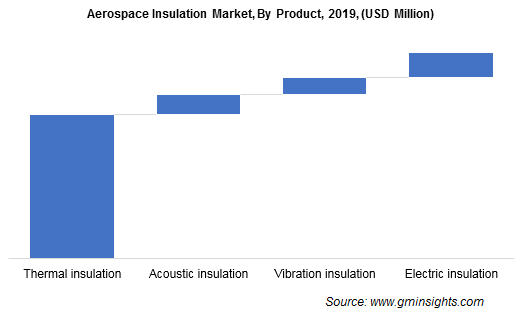 Growing population along with better profitability achieved are among the major factors influencing the investment in the aerospace insulation market share from 2018 to 2024. Aerospace insulation industry is fragmented with presence of regional as well as local players. The market players include 3M, AVS Industries, BASF, Boyd Corporation, Duracote Corporation, DuPont, Elmelin Ltd., Esterline Technologies, Evonik Industries, Hutchinson, Jhons Manville, Orcon, Polymer Technologies, Promat, Thermodyne, Triumph Group, UPF Corporation, Promat, Rogers Corporation, Zodiac and Zotefoams. Industry participants are undergoing long term agreement with aircraft manufacturers to enhance their market share. For instance, in June 2017, Esterline Corporation signed four years contract with Boeing to provide product solutions for military aircrafts. Aircraft insulation play an important role in protecting passengers and crew from frigid temperature and engine noise at high altitudes. The layer resists fire penetration and enhances flame retardancy in case of any accident. Further, the OEMs are adopting lightweight materials to support weight reduction and improving fuel efficiency.